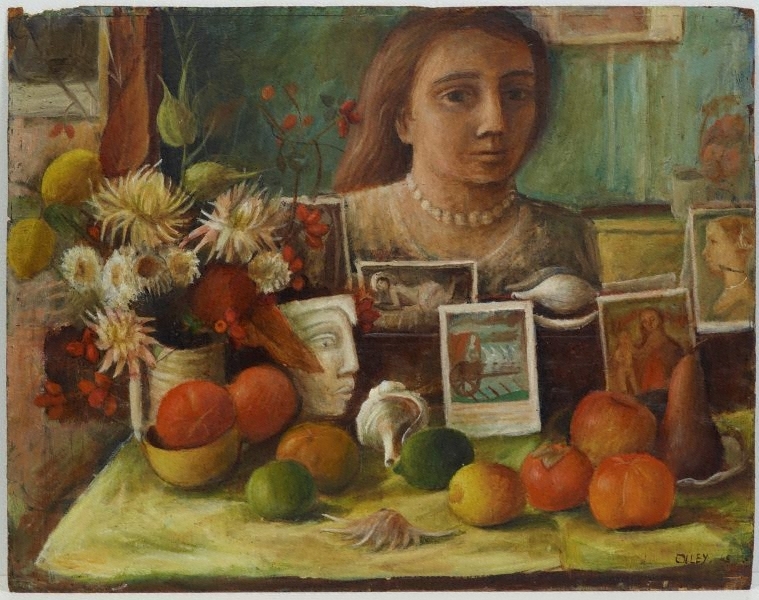 In this early self-portrait, Margaret Olley surrounds herself with the things that would preoccupy her throughout her career: the fruits, flowers and exotic objects that she collected about her at home. Her tribute to past great masters of art, seen in the array of postcard reproductions, would also become a frequent feature of her work. 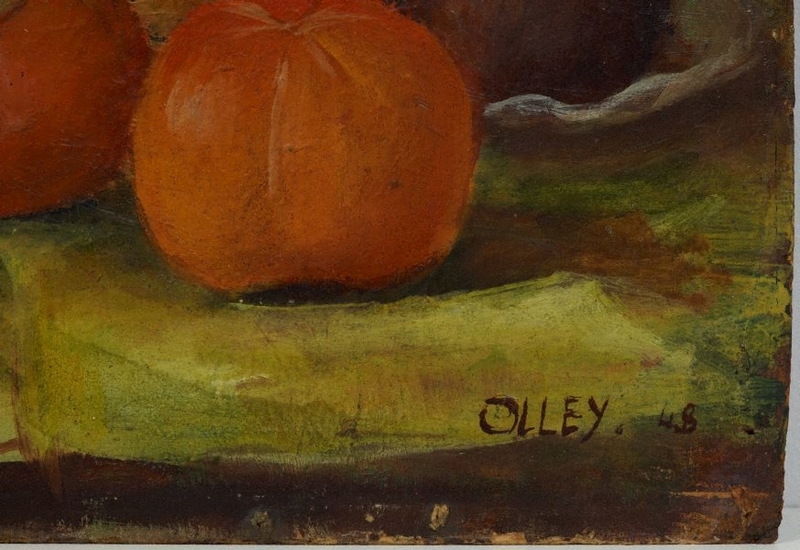 This painting marked an important time for Olley as a young artist commencing her career. She held her first solo exhibition at Sydney’s Macquarie Galleries, from which the Art Gallery of New South Wales and the National Gallery of Victoria both purchased works. 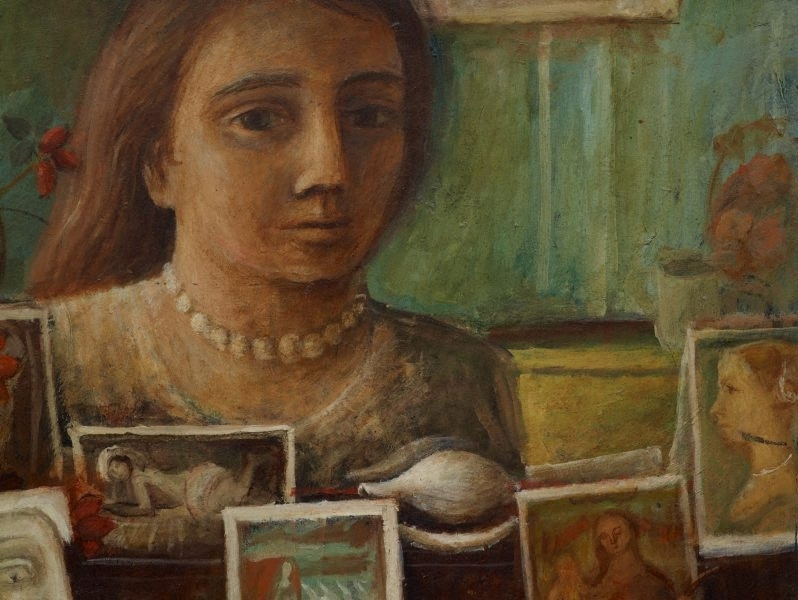 The following year, after attracting attention as the subject of William Dobell’s Archibald Prize-winning portrait, she departed for Europe to explore the international art scene. Signed and dated l.r.corner, brown oil "OLLEY .48". Glenn R. Cooke, The world of Antiques & Art , 'Margaret Olley: a tribute for her 80th year', pg. 24-34, Bondi Junction, Feb 2003-Jul 2003, 24 (colour illus. ), 32. Christine France, Parallel visions: works from the Australian collection , 'Donald Friend / Margaret Olley', pg. 128-139, Sydney, 2002, 19, 128, 134 (colour illus. ), 135 (colour illus., detail), 145, 147. Janet Hawley., Good weekend , 'Queen of subjects', Broadway, 25 Mar 1995, 35 (colour illus. ), 36. Lenny Ann Low, The Sydney Morning Herald , 'It's artless: Olsen and Olley hold back donations after tax decree', pg. 8, Sydney, 25 Sep 2002, 8 (illus.). Louise Martin-Chew, Art and Australia (Vol. 44, No. 1) , 'Margaret Olley and Donald Friend', pg. 114, Sydney, Sep 2006-Nov 2006, 114 (colour illus.). Review of Margaret Olley and Donald Friend exhibition. John McDonald., The Sydney Morning Herald , 'Overdue tribute to an icon of integrity', Sydney, 25 Aug 1990, page unknown. Barry Pearce, Look , 'Eulogy for Margaret Olley: given by Barry Pearce on July 29, 2011', pg. 12-14, Sydney, Oct 2011, 13 (colour illus.). Renée Porter, Margaret Olley: painter, peer, mentor, muse , 'Margaret Olley: a celebration of life in paint', pg. 8-36, The Rocks, 2017, 52, 53 (colour illus. ), 112. Andrew Sayers, To look within: self portraits in Australia , 'The artist's self-portrait in Australia', pg. 6-33, Brisbane, 2004, 39 (colour illus.). Jane Watters, Reflections: the National Trust Quarterly , 'Margaret Olley & Donald Friend', pg. 22-24, Sydney, Feb 2006-Apr 2006, 22 (colour illus.). Enter Art , Sydney, 2000, sheet number 13 (colour illus.). Education kit produced by the NSW Dept of Education and Training as teaching resource for primary school teachers. 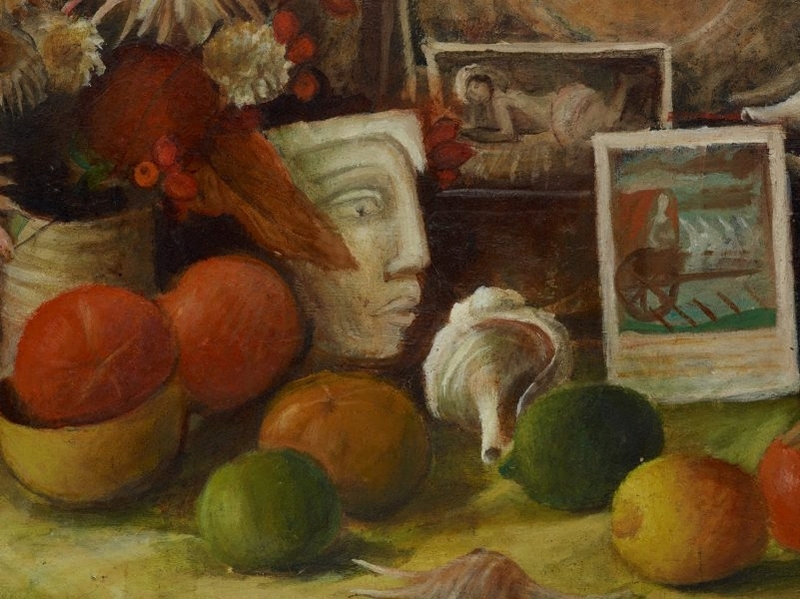 Margaret Olley: far from a still life , Milsons Point, 2005, 186, 196, 479, 505. Look , Sydney, Nov 2005, 43 (colour illus.). The Sydney Morning Herald , 'Massive forms in Margaret Olley pictures', Sydney, 30 Jun 1948, page unknown. Review of Macquarie Gallery exhibition. Breaking new ground: Brisbane women artists of the mid twentieth century , Brisbane, 2007, 33, 35 (colour illus. ), 69.